NORMAN, OK: Dr. Barney Capehart, an ISE Professor Emeritus, was chosen by his alma mater, University of Oklahoma, as one of two graduates to be inducted as members of the College of Engineering Distinguished Graduate Society. Dr. Capehart received a plaque at the induction ceremony during the College of Engineering Convocation on May 12, 2012, at the University of Oklahoma. Selection for this honor is based on professional and technical achievement, public service, contribution and support for education, and contributions to the profession of engineering. 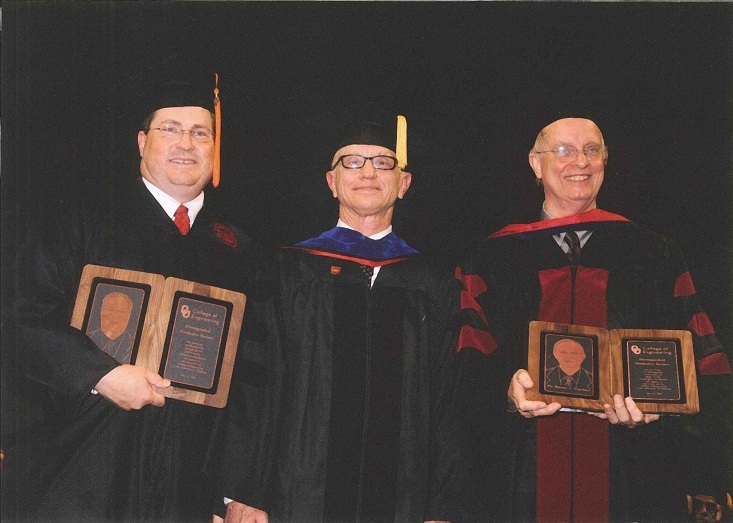 Capehart (to the right in the picture) is shown with Dean Tom Landers (center) and the other award recipient. Capehart is known for his work in energy management and is a fellow of both IIE and IEEE.